After taking in the “Destroy the Picture: Painting the Void 1949-1962” exhibit, I knew I had to bring a little Gutai home. 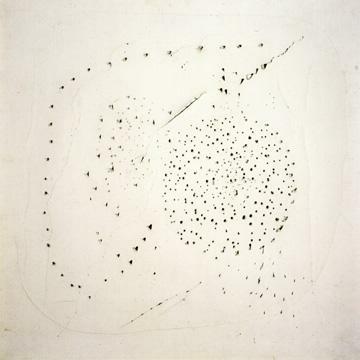 The postwar Gutai movement was a collective of about 59 Japanese artists who created avant-garde art from 1959 to 1972. The movement was about pushing the boundaries of creative freedom through painting, performance, interactive art and experimentalism. A few weeks after my solo visit, I took Brian and the boys with me to view the exhibit. Predictably, they loved it. Brian, whose father fought in WWII, including the D-Day invasion, was moved by the global artistic response to the events that so influenced his father and, thereby, his own upbringing. The boys were entranced with the seemingly reckless destruction of the things which, in their own lives, they’re not allowed to even touch. (I can hear myself saying, “We don’t touch art, boys,” over and over again.) But blowtorches? Shooting guns at balloons filled with paint so that the paint drips down the canvas like blood? Knives slashing at a canvas? Guys swinging from ropes as they paint with their feet? In little boy world, this is as awesome as art gets. In one of the galleries, the MCA displayed a film of some of these Japanese Gutai artists at work. One glimpse of an artist painting with his feet, and I knew what I had to do. We had to get all experimental on our own turf. First step to low-brow avant-garde at home: taping butcher paper to our basement floor. Next step was to drizzle the paint color of the boys’ choice on the paper and brace for some slip-sliding. None of us could wait to start in on this mess. Keeping control of his feet on the slippery tempera paint was a welcome challenge for Charlie. The lunge method proved to be one of Charlie’s favorites. That and spinning around. Note the accidental background shot of me in a pose I usually reserve for the hoods of sports cars. The only rule in the Quinn family experimental art collective: Anything goes. You want to swing on a ladder with your paint-covered toes, then swing on, artiste. Brian’s avant-garde footwork makes a nice little painting. Our finished art dries in the dining room. Next steps: Let the boys rip them to their liking? Create our own “run-through” sign? Dare we “destroy the picture?” Stay tuned!